In the middle of the 19th century there were two separate houses on this site, both leased (as were the next two properties) from Thomas Turpin1. The house that once stood on your left was home to John Vass, baker and confectioner. In the whole of Ireland at the time there were only nine Vass's, and two of these were in the Queen's County: 'our' man here, and Michael who lived in Newtown, Stradbally. Fifty years later, only Archibald Vass - army pensioner, keeper of Stradbally courthouse, and a member of The Plymouth Brethren - remained and, a decade after that, there wasn't a single Vass in the county. The name, incidentally, is an Anglicisation of Vaux, the French placename whence the family originated before coming to England after the Norman Conquest. Anyway, John Vass was succeeded by David Mercier2 the baker, corn and flour dealer who later relocated to Church Street. John Vass's next-door neighbour was John Gaze3 whose surname, via the firm of Gaze & Jessop, was familiar to generations of townspeople. For more on this, see the entry for No. 1, Coote Street (also referred to as No. 21 Market Square) in Part One of this project. In 1856, John Gaze was a plumber and 'car provider'; by 1870, an auctioner and valuer living in Tower Hill and, from 1871 to 1887, a hotel owner4 and a member of the Town Commission. Apart from this John Gaze (listed at the above address, and also as a landowner in Borris Little), Griffith's Valuation has only one other person with this surname. The 1901 Census lists no-one of that name in Ireland at all, but in 1911 there was one family living in Pembroke Road, Dublin. Formerly a hotelier in Maryborough, Francis Hinds Gaze (John's son) was now a tramway timekeeper, and his sons, George and Ernest, tramway mechanic and cycle salesman respectively. 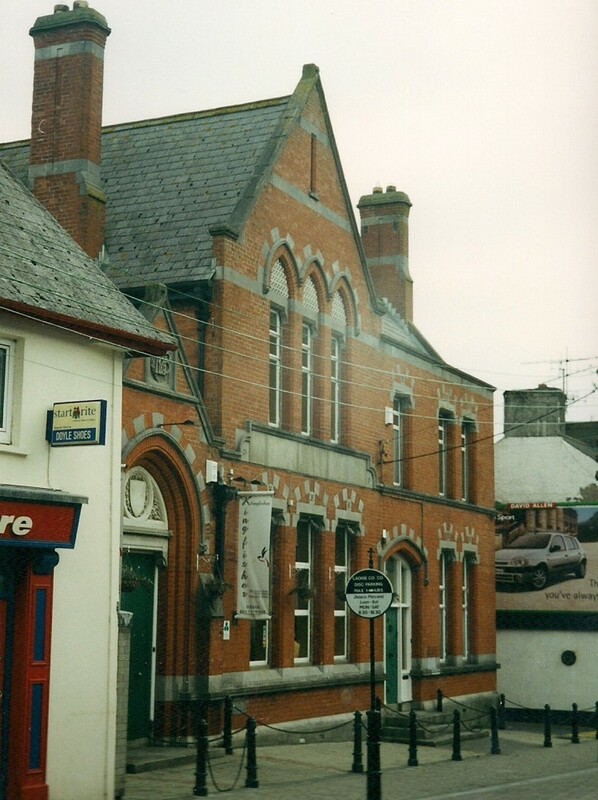 After the Munster & Leinster Bank came into existence in 1885, its Maryborough branch was briefly housed in what is today the former County Hotel straight across the street. The fine building above was designed by architect John Joseph O'Callaghan and, during its construction, five men were seriously injured when a limestone block fell and smashed the scaffolding. The Munster & Leinster Bank opened its doors here in 1892 - note the partly-visible monogram M & L B above the door on the left - and traded under that name until 1966 when it and two other banks amalgamated to form Allied Irish Banks Limited. AIB continued here until the late 1980's when it relocated to Lyster Square. The Kingfisher Indian restaurant opened in 1997. In October 2012, it was rebranded as the Bhukhara Dining room (Not just a restaurant; it is a new concept of creative food and culinary art) and closed down less than a year later. The portion of the building on the right was the bank manager's residence. Its first occupant, J. P. Curran, was also treasurer of Maryborough Athletic Sports Club. In 1901, the manager - whose census details are a 'doctorish' scrawl - was, I think, Jon. L. Langley, though the enumerator thought it was Laugley. There is no such uncertainty about the next incumbents: Mr George Blackall from Tipperary, and well into living memory, Mr David Wilson. In 2006, the building was occupied by interior designer Rob Collins who opened part of it as showrooms for his designs. Since then it has housed various enterprises, most recently the Old Bank House Tea Rooms & Tapas Bar (until mid-2013) and, from June 2014, Healthy Living Ireland, Research and Education (Raw/Living food classes, Juicing Demonstrations, Blood Analysis, Detoxification etc. etc.). In October of that year, Healthy Living Ireland also opened a restaurant, The Live Kitchen, here. A year later, this was replaced by Stephan's 5 Elements Kitchen. 1 See the first page of Part One of this project. On September 26, 1877, Thomas Wilson was driving down the lane - in a horse and car owned by Francis Gaze - when he underestimated the height of the arch.... An eyewitness and some millworkers lifted him on to the car and brought him to Mr Gaze's hotel. The latter had him conveyed to Dr Jacob's, but it was too late; the unfortunate man was dead. The Freeman's Journal criticised the archway 'as a most dangerous one to the public safety, being little better than a hole pierced through the ground portion of the mill' and, as someone who, a century later, could barely ease his car through, I endorse every word of that. Milling continued there until 1908, after which time the huge building became a storehouse. In the 1970's, it housed door- and window-frames for the late Nicholas Boran's joinery agency and was eventually demolished in 1981. For an atmospheric account of the building's final days, see The Invisible Prison (The Dedalus Press. 2009) by Nicholas's son, Pat. 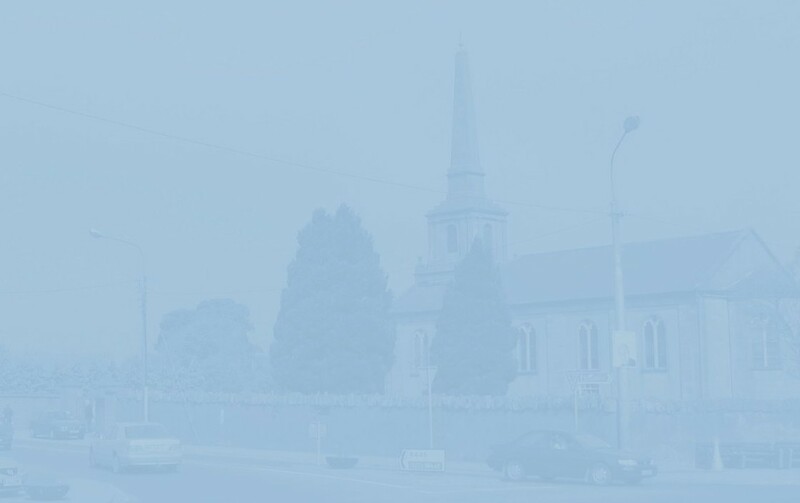 3 On the night of November 17, 1851, the Gaze family had a very narrow escape when, as reported in the Leinster Express, 'a fire of an alarming nature' broke out while they were sleeping. Much damage was done to the house, but, despite 'the entire roof being on fire over them', the family of seven was rescued. 4 I have seen it written elsewhere that Gaze's Hotel once stood on the above site. It was, in fact, located where Lethean Bar is today. More on Gaze's Hotel later.